Astigmatism occurs when the surface of the eye and/or the crystaline lens (inside the eye) are not shaped like a sphere. 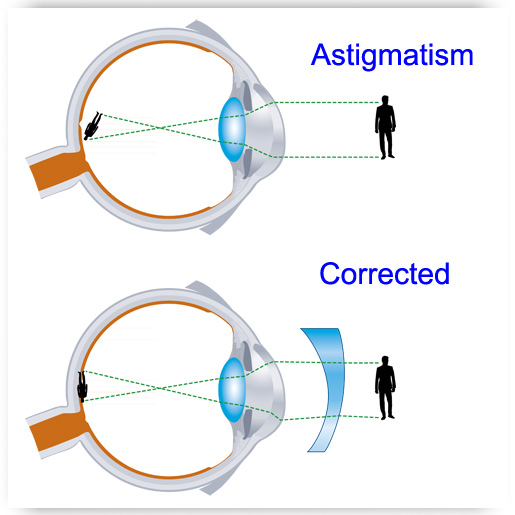 It is normal to have astigmatism, but it is usually not really high in magnitude. When the astigmatism in a patient is really severe, it can sometimes indicate a disease called Keratoconus. How Can i Tell From my Prescription if i Have Astigmatism. There are several sets of numbers involved in a prescription. The first number always indicates whether a patient is near sighted or far sighted. The second number represents the degree of astigmatism. Ophthalmologists represent astigmatism in “plus” cylinder form and optometrists represent astigmatism in “minus” cylinder form. For a video that explains how to read your prescription please click here and scroll to the bottom of the page. Treatment options: eyeglasses, contact lenses or surgery.